One of the best modern auditoriums in the world, Valencia’s Music Palace has been praised for its sound quality by music greats such as Caballé, Mehta, and Barenboim. The Palau de la Música turned 30 in 2017 and offered an Open Doors Day for the general public, featuring free concerts and rehearsals by Valencia’s Orchestra and several local conservatory students. In his first performance there, Opera legend Plácido Domingo said “The Palau is a Stradivarius”. Located on the Turia’s old riverbed, Valencia’s Palau de la Musica is the home of the city’s municipal orchestra, founded in 1943. 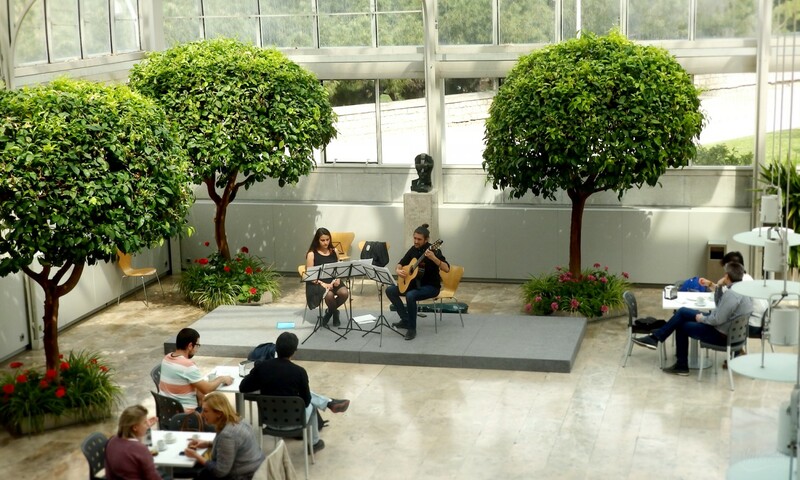 It hosts all kinds of activities from conferences to art exhibitions and of course, classical music concerts. The palace is surrounded by beautiful green spaces and a pond designed by Ricardo Bofill to integrate the building with the Turia Gardens as a unique space. Designed by José María de Paredes, National Prize of Architecture and designer of other Spanish auditoriums such as the ones in Madrid and Granada, it was inaugurated on April 25, 1987. Since then, it has become increasingly popular, receiving 500,000 visitors per year. From 10am to 1pm and 5 to 9:30pm.